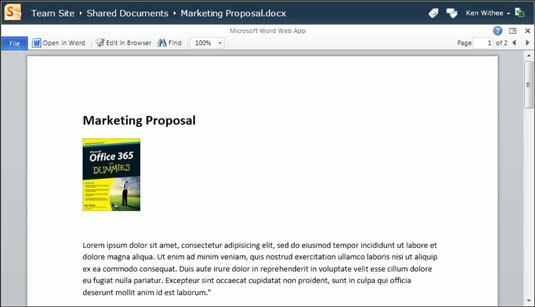 Creating a new Word document in a SharePoint Online document library is easy. You simply browse to the Documents tab on the Ribbon and then click the New Document button in the Ribbon. 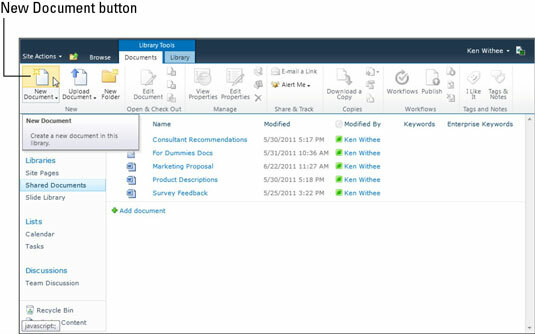 The New Document button is used to create a new document. The type of document that is created depends on the default content type for the library. The Shared Documents library, which comes standard out of the box with SharePoint, uses the Word document as its default content type. If you, or your administrator, changed the default content type or created a document library based on a different content type, then clicking the New Document button creates whatever document type is set as the default content type. For example, if you set an Excel document as the default content type, then clicking New Document will create an Excel document. When you create a new document, SharePoint is smart enough to determine if you already have Microsoft Office Word installed locally on your computer. If you do have Word installed locally, then Word will open so that you can develop your document in the full-featured application. If you do not have Word installed, then the new Word document will open in the browser in edit mode so that you can develop your document by using the Word Web App. After you have finished developing your application, you can save it. Doing this automatically saves it to the document library in which you created it. You can then click on the document to view it and then edit it further by using either the Word Web App or the local Word application running on your computer. Besides working with Word documents in Editing Mode, you may simply want to read the document and not edit it. When you want to only read the document, you can switch to Reading Mode, which looks very similar to a document that is printed on paper.